When good elastics go bad is one of those metaphor for life. I don’t know if it’s just not wanting change, couldn’t be bothered or feeling like I can make do with what I have that makes these decisions. This came to mind the other day when I was putting an elastic in my hair to keep it pulled back. The elastic in use was old, lost its bounce and took about 10 times around to get the hair in a ponytail. I might as well been using string. It would probably have been easier. 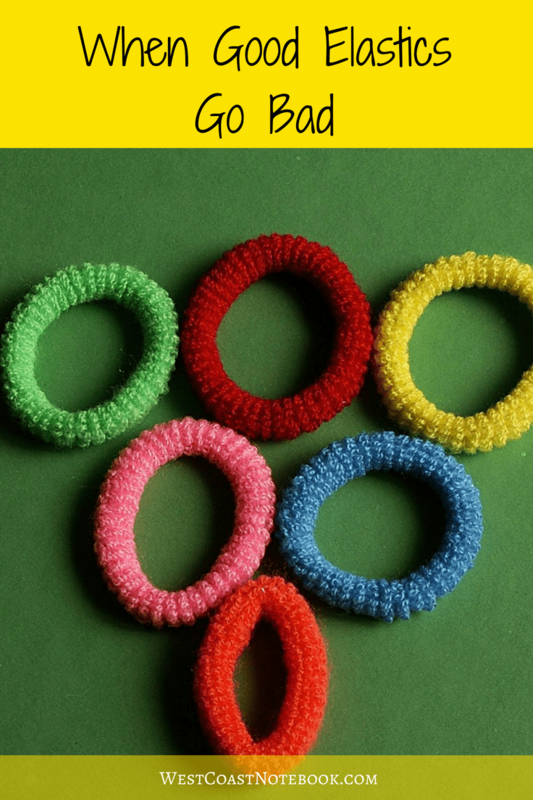 For months, I’ve been meaning to buy more elastics, but you know… it just wasn’t on the top of my priority list. On the other hand… every time I went to put an elastic in my hair I would look through my stash to see if there was one that wasn’t as stretched out as the others and then use that. Every time it was an annoyance, like sitting on a sharp rock. Didn’t bother me enough to move, but I felt it nonetheless. And yet, I wanted to just go to the drawer, pick out a colour that I wanted for the day and put it into my hair. I didn’t want the decision of it to be a good one or a bad one. I just wanted it to work. So why wasn’t I taking action? Why prolong the agony? It’s like the socks with a hole in them that you continue to wear because they are your favourite socks and not one will see. Or the underwear that has lost it’s elastic (seem to be on an elastic kick) but they are soft, comfy and no one will see them (or will they). It’s the food in the fridge that is almost to the point of going bad but would be okay if you ate it today and you leave it until tomorrow. The clothes in the closet that no longer fit, but they hang there just in case one day they will fit again without thinking that they will be out of style by the time you get there. Even better, how about the junk drawer that we all have, that just holds junk. At one time, you were going to use that particular item, but as you haven’t seen it or used it in 3 years. They all have a due date and eventually, they go bad. Sometimes bad is that they had disintegrated to the point that they are no longer useful, like my elastics. Other times it’s because like in the junk drawer or closet you are having to make a decision or put one off. How much freer our minds and life would be if when we looked in the junk drawer it wasn’t with the thought that one day I should clean this up. Or with the closet that is constantly in your face giving you feedback on once was or could be. The only positive one I can think of is when good veggies go bad and I put them into the compost and they get good again. Otherwise, these items cause me to procrastinate, feel disorganised and take up a lot of energy that could be put to better use. And yet… I still have a junk drawer and a closet with clothes that don’t fit. On the other hand, I have new elastics and my life is almost complete. At least it is every time I go to pull my hair back. And… I have different colours for each day of the week or outfit I wear. Life is good. As for the other things, I still have them to look forward to dealing with, but maybe with a more philosophical attitude. I don’t have to do it all at once and I’m now considering it a work in progress. I have new elastics and the socks and underwear are gone and I might just throw out something from the junk drawer tomorrow. We don’t want to rush these things. Which begs the question… How many good things do you have that have gone bad?